A Canal Winchester man was sentenced to five years in prison Tuesday afternoon after he pleaded guilty to a felonious assault charge in connection to a March shooting in Delaware. William Devan Lassiter, 34, appeared in Delaware County Common Pleas Court Tuesday afternoon for a change of plea and sentencing hearing after reaching a plea agreement with prosecutors. Assistant Delaware County Prosecutor Andrew Bigler said the terms of the agreement were that Lassiter would plead guilty to a count of felonious assault, a second-degree felony and plead guilty to the firearm specification attached to the charge. Bigler said prosecutors would dismiss a charge of aggravated robbery, a first-degree felony and a charge of theft, a fifth-degree felony. Additionally both Bigler and Lassiter’s defense attorneys would recommend to Delaware County Common Pleas Judge David Gormley that Lassiter be sentenced to five years in prison. Gormley asked Lassiter to tell him about the March 4 incident that the charges stem from before Lassiter could change his plea. Lassiter said on that date he went to the Delaware home of William Sims, a local dog breeder, where her and Sims struggled over a gun. Lassiter said the gun went off during the struggle and Sims was shot in the leg. Bigler said the struggle stemmed from Lassiter buying a dog from Sims but Sims not giving him the license to the dog until he paid the full amount. Bigler said after Sims was shot, Lassiter fled the scene but was later stopped on Interstate-71 by Delaware County Sheriff’s deputies and was taken into custody. Lassiter added that if he was sent to prison he would “make the best of it” and try to become a better person. Gormley sentenced him to four years in prison for the felonious assault charge and sentenced him to one year in prison for the firearm specification. Gormley ordered that these sentences be served consecutively. Lassiter was given six days of credit for time spent in the Delaware County Jail. Bigler said he had spoke to Sims and said Sims was satisfied with this resolution. Bigler said Sims suffered a femur fracture as the result of the shooting. He has since been released from the hospital. According to the Ohio Department of Corrections, Lassiter is currently serving a six-year sentence from a prior felony case in Jefferson County. Gormley said he will begin serving the five years on the Delaware case when the Jefferson sentence has expired. Lassiter said he was out on parole when the shooting occurred in March. 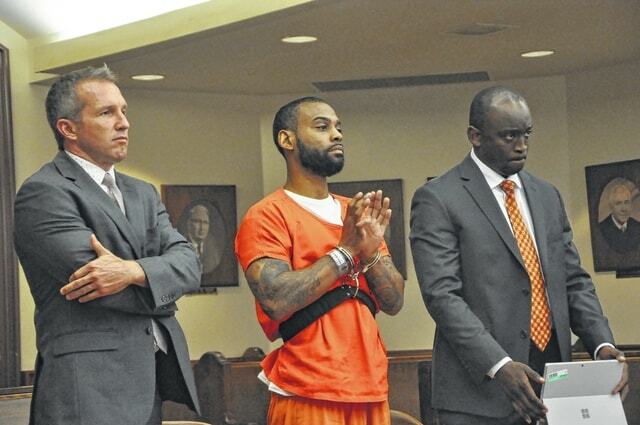 William Devan Lassiter raises his right hand to be sword in during the change of plea hearing Tuesday. Lassiter was represented at the hearing by Delaware attorney Jermaine L. Colquitt and Columbus attorney Jeremy Dodgion(left). http://aimmedianetwork.com/wp-content/uploads/sites/40/2016/09/web1_Lassiter-Plea.jpgWilliam Devan Lassiter raises his right hand to be sword in during the change of plea hearing Tuesday. Lassiter was represented at the hearing by Delaware attorney Jermaine L. Colquitt and Columbus attorney Jeremy Dodgion(left).